Brand-new homes in the San Fernando Valley with all the space and style you want and without HOA or Mello-Roos fees? 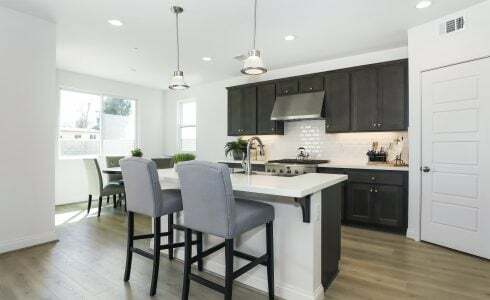 No wonder new-home buyers are clamoring to buy one of these new single-family residences at Palmilla, Williams Homes’ newest community in Sylmar! Just 12 of these large homes on oversized lots are being built and more than half are already sold, so interested buyers will want to contact a sales professional to make an appointment for a tour of the model homes and learn more about the Quick Move Homes right away. 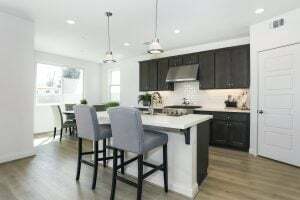 Gourmet kitchens with huge islands are one of the standard features in these popular new homes in the San Fernando Valley. Residence One at Palmilla presents 2,548 square feet with 4 bedrooms and 3.5 bathrooms. This highly desirable single-story plan is ideal for families of all sizes, retirees, and multigenerational households. The huge island is the centerpiece of the chef’s kitchen, and provides extensive workspace as well as an ideal spot for casual meals, cookie baking, and homework. This amazing space is open to the great room and dining room, creating great flow and open sightlines. The master suite is another highlight of this floorplan, tucked into the back corner of the home for privacy and featuring a large walk-in closet and a spa bath with a separate soaking tub and walk-in shower. This home also features a covered patio in the backyard and a three-car garage. Looking for even more space when buying new homes in the San Fernando Valley? Residence Two at Palmilla presents an amazing 3,329 square feet with 4 bedrooms and 3.5 bathrooms. This gorgeous two-story home offers a convenient downstairs bedroom and bath for guests, older children, or parents. The kitchen is a gourmet dream, with its massive island and huge pantry, and opens right into both the great room and breakfast nook. A gracious covered patio is just beyond. In this plan, you also get a separate formal dining room and a living room, perfect for more formal gatherings. Upstairs are three bedrooms including the luxe master with its relaxing en-suite bath and enormous walk-in closet, plus a large loft and a tech center—just a few of the many thoughtful touches that make the floorplan so spectacular. This home also features a tandem three-car garage. For more information about these new homes in the San Fernando Valley, visit Williams Homes. This renowned California builder was founded in 1997 on the principles of integrity, trust, and partnership and has continued to thrive as one of the state’s fastest-growing homebuilders. Williams Homes was the proud recipient of the 2013 Builder of the Year Award by the Building Industry Association. You can also register to receive updates on the community here.